As World War II passes from living memory to documented history, the struggle to keep the devastating conflict vivid in the public imagination is urgent. 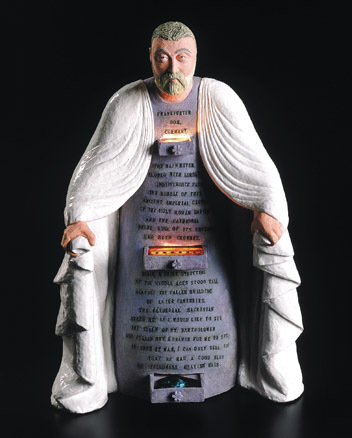 This call is answered in the exhibit Remembered Light, on display October 15-19 at the Salt Palace Convention Center, in conjunction with the 2015 Parliament of the World Religions conference. The exhibit is comprised of pieces inspired by the stained-glass fragments and memories of World War II veteran, Frank McDonald (1908-2002). Each artist in Remembered Light incorporates the glass fragments into a piece that interprets themes of loss, devastation, and continual striving for peace. 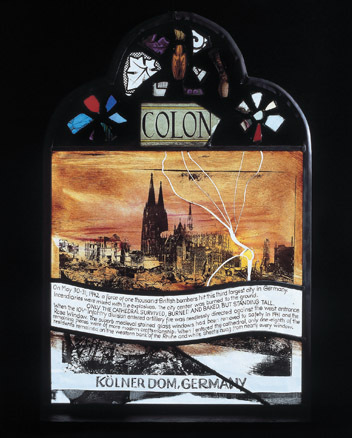 One artist, Irmigard Steding, who grew up in Germany during the war, creates a multi-media image of the ruins of the cathedral Kölner Dom. The overall shape of the sculpture is a reminiscent of a cathedral window, with an image of the edifice itself in the center. McDonald’s fragments sit somberly above the scene, as cracks spread through the center of the piece. However, a pink tint behind the image of the cathedral suggests a new dawn. The piece gives a view of both grief and reconstruction. Another work, by Misty Gamble, is a sculpture of Saint Bartholomew. Three drawers, lit from within, hold McDonald’s glass fragments. Gamble states that Bartholomew protected Frankfurt Cathedral during World War II, and Bartholomew’s figure now watches over McDonald’s shards. Here, the shards are relics enclosed in the body of the saint, whereas in the cathedral pieces of the saint’s body are on display for pilgrims and the faithful. The work speaks to the intertwined nature of place and religious worship, of fragments and their ability to heal. The exhibit as a whole gives physical forms to ideas about how war and devastation can fracture the individual and collective psyche—just as bombs break apart physical bodies. It also offers hope that by remembering, accepting, and processing trauma, future generations can create something beautiful and peaceful in its wake.